Okay, so I may have cheaped out on this one, but believe it or not this is one of the first scripts I jotted down back when the concept for QP first came to me. We’ve introduced almost the entire starting lineup already if you count last week’s “test” image. Who are we missing…? The duck head in the back was bothering me a bit, although, upon reflection, I suppose it’s no different than having a sculpture of a head in one’s home. Actually that wooden box contains bits and pieces of labels and whatnot from the various ducks that I didn’t want to lose or throw away, including Li’s collar/tag. Is Neil still at the concert? We’re still at the “sitcom” stage… besides, the “concert” strip was more along the lines of testing the layout and construction techniques than about story. I’ll be making the setup a bit more clear as we go along. 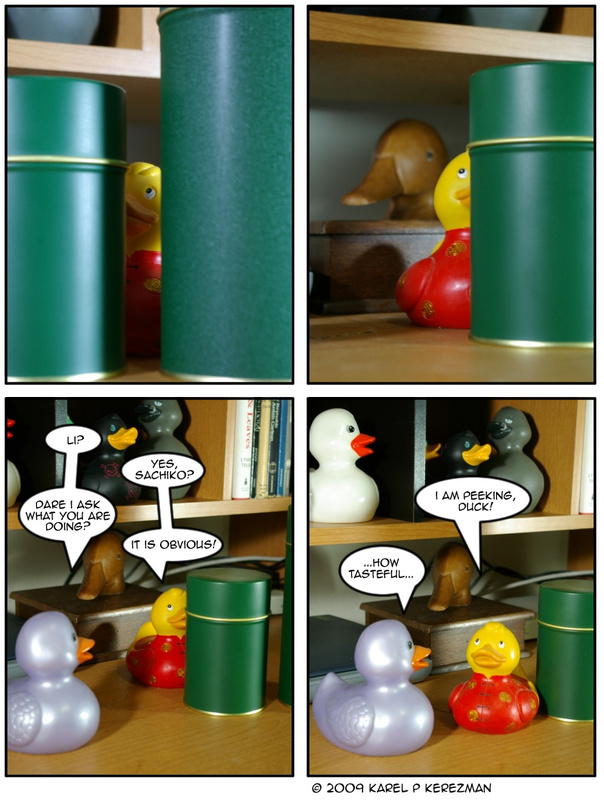 Oh, I understood all that… you just asked which duck was missing. I just gave you an explanation as to where he may be. Have we not met the black duck with the crossed out eyes and green beak? *studying the banner* Or was that just a rhetorical question? Either way, this all makes me want to start a rubber duck collection. this conversation is really amusing….